Can I say how glad I am to have a topic for today’s blog post? Okay, I’ll say it. I’m glad. Let’s look at the photos I took in February. Flowers made a big comeback in February, appearing 7 times. Food, as always, tops the list with 11 shots and there are only 2 photos with people. I’ll make an effort to do better with people photos this month. Rounding out the subjects: spinning, knitting, home decor and games. It was a great month from the first photo to the last! March could offer opportunities for two-fer photos – flowers and people, food and people … I especially like the Feb. one of cream puffs and tulips. Yes! Cream puffs, flowers and manicures! Fun month Carole. Fantastic month! I particularly love the spinning! Just beautiful, Carole! So much fun in your life Carole! Those olives look so good! I’m struck by all your beautiful tulips and the grand finish of a crocus! February was good to you! 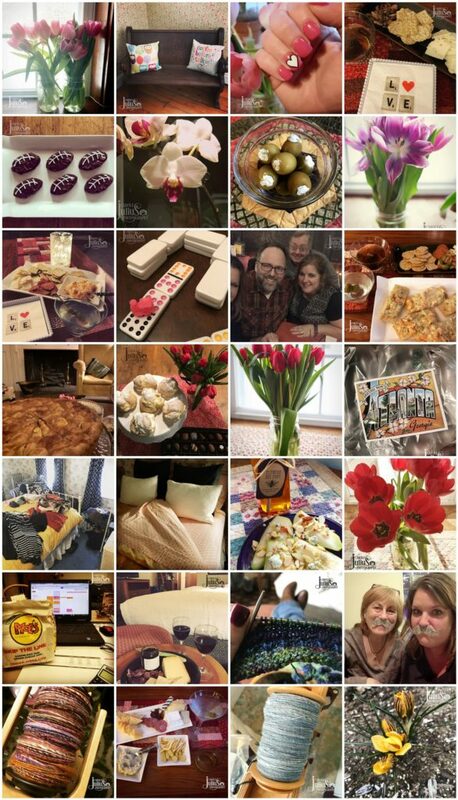 I would know February without you even having to say … LOVE how the love shines through in your collage! a fun recap of the month-I need to make a point to be IN more of my photos!